Do kids today get the same romantic thrill out of making their crush an iPod playlist as we did when we made our mix tapes? Somehow I wonder. I remember someone in college who had a tape called The Omega Tape, so named not because it was the alpha and omega of mix tapes, but because he drove an Oldmobile Omega, and that's the car he played it in. We all made copies and I thought it was the most adult tape I had ever seen, because it didn't contain the basic top 40 songs I was used to. I remember it had "A Girl in Trouble (Is A Temporary Thing)" by Romeo Void, XTC's "Senses Working Overtime," "Never Say Never" (also Romeo Void), Bob Marley's "Jammin'" and a whole lot of others. And my husband Rob was a big mix-tape maker for me when we were dating. He lived in California and I lived in Minnesota and the music he sent made me feel closer to him. One of the songs seemed to fit our very different climates--Dramarama's "It's Still Warm Out Here." We ended up using two of his mix-tape songs, that one and Redd Kross's "Love Is Not Love," on our wedding videotape. I think the videographers thought we were nuts, but we did it anyway. Share your favorite mix tape memories, or songs, in the comments. Also, RIP, Alex Chilton. I love mixtapes. Until quite recently, I still made them. When I was a kid and still listened to the radio, I used to make mixtapes by taping off the radio. (Everyone did this, right?) I have a couple shoeboxes with those "radio" mixes. They smack so much of the time they were recorded they're practically encased in amber. I love my mixed tapes. I still have a few of them. Too bad I don't have a cassette player anymore. Wow... just reading about XTC and Romeo Void brings back so many memories. 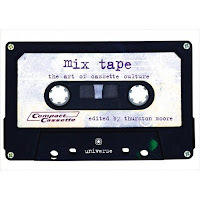 Growing up, I recall that mix tapes were composed with great care (even when taping off the radio), and the exchanging of them was the sign of a truly serious friendship/relationship. Also, mix tapes typically contained oddball songs (and sometimes comedy bits) that you didn't hear all that often, making them all the more special. Back in the 80's my friends and I were into all kinds of obscure New Wave music, so mix tapes were an important way of sharing and exposing others to new music in the days before iTunes, Napster and Facebook. The cassette recorder is IMHO one technology whose loss has not been completely replaced by anything better, simpler or cheaper. LOVE my mixed tapes. The playlists of my mixed tapes are so ingrained into my head that when a song comes on the radio, I expect the next song to play will be what's on my mix. Today, for instance, caught Devil Went Down to Georgia, so the next song should be Sugar Magnolia, because that's how it's listed on the "Lost My Sh*t" tape. I was disappointed that the station didn't comply. Oh the thrill of making (and getting) a mixed tape! Do they burn CDs for eachother now? Or, seriously, a play list? Just doesn't seem the same. It's all so easy. The mixed tape took some real effort.